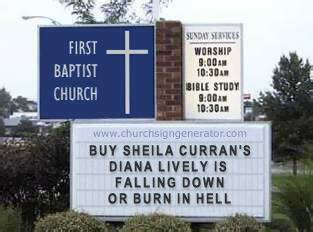 HELP US MAKE DIANA LIVELY! Please, volunteer for Sheila’s nefarious Word-of-Mouth campaign. Can we send you postcards to send to friends and family? 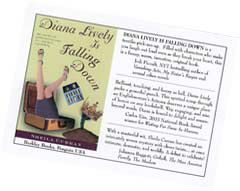 How about an intriguing rear window static-cling decal that says Diana Lively is Falling Down? Or give us your email (below) and we’ll keep you in the loop about various book-related things, share the results of the Vile Husband contest and generally help us to spread the word. CLUBS I recently developed some questions for reading groups, which will be published in Reading Group Choices for 2006. Click here to read the profile. And be sure to check out the web site: www.readinggroupchoices.com. July 25 Booksigning, Post Hall, Mount Vernon College, 2100 Foxhall Road N.W. Washington D.C.
Sheila and poet Juan Carlos Galleano open the popular Warehouse Reading Series sponsored by the Florida State University writing program.